We tested over 30 different over-the-counter snoring mouthpieces and rated each using a weighted grading system which takes into account factors such as effectiveness, comfort, fit, product quality, and value. The results were then analyzed and an overall score was assigned to each mouthpiece. The table below showcases the top three products out of over 30 that were tested. The SleepTight Mouthpiece was designed by Dr. Michael Williams, a seasoned dentist who has spent over 40 years in practice. The SleepTight is an easy-to-fit one piece MAD that is made from a safe thermoplastic material which has been cleared by the FDA. It’s extremely durable and is able to last up to 24 months. 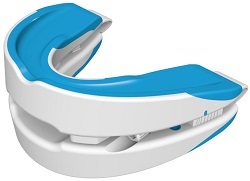 SleepTight has offered Snoring Mouthpiece Guide readers an exclusive Buy 1 Get 1 deal. Offer can be found here. 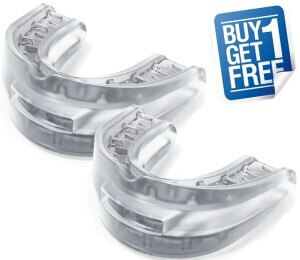 Receive TWO mouthpieces for the same price that others are charging for one. Keep one as a backup or give it away to a spouse or friend. Double laminate design offers an unmatched fit that's comfortable and stays in your mouth throughout the night. The Good Morning Snore Solution (GMSS) is a tongue stabilizing device that was designed by Dr. Leslie Dort. This mouthpiece has been scientifically proven to stop snoring. Because it sits outside of the mouth, some people prefer it over traditional mouthpieces which sit entirely inside of the mouth. Unfortunately, one of the downsides of this product is that you must be able to breathe through your mouth in order to use it. Made from a very thin silicone material that slips over the tip of the tongue and rests outside of the mouth. Unlike traditional mouthpieces, the GMSS does not require any fitting. It's one-size-fits-all, so it's ready to use out of the package. A 2008 randomized, controlled, crossover study proved that the GMSS significantly reduces respiratory disturbances and snoring. For years, VitalSleep has been the leader in the adjustable MAD category. VitalSleep contains a screw adjustment on either side of the mouthpiece which can be turned using the provided hex key. 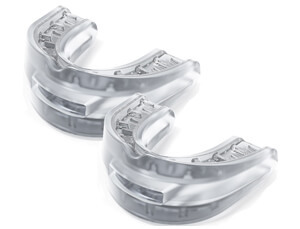 It’s the only mouthpiece available with a 1-year guarantee – If it breaks, they will replace it for free. Unique micro-adjustment feature which allows you to fine-tune the lower tray until your snoring stops. The new and improved design features a soft plastic tray lining which can be heated in warm water to create a custom fit. Offered in 2 sizes - Small for women and Regular for men.